Pacific Environment’s 2013 Rule of Law Project interns (pictured here) are helping environmental groups across China use legal tools to stop polluters and help pollution victims. What do you do when all else fails to stop a polluter in China? Increasingly, local communities impacted by pollution are turning to the courts to settle disputes. Pacific Environment helps local environmental groups support pollution victims in their communities, while also giving these local leaders the tools they need to participate in citizen enforcement of China’s environmental laws. These types of citizen enforcement activities are routine in the United States but quite novel and untested in China. Here is a short overview of the current state of environmental public interest law in China and the role local groups play in advancing environmental justice. The opening of regional environmental courts in the past several years is a positive sign of changing attitudes about enforcement of environmental laws in China. Between 2007 and 2012, more than 60 environmental courts opened, and the most active of these courts have heard hundreds of cases. Rachel Stern, author of a recent book on environmental litigation in China, notes that once a case reaches court, it has about a 50% chance of providing the victims with some kind of compensation. The number of environmental lawsuits in China increased over the past decade, but Stern notes that the reasons are unclear. The increased use of courts could mirror the devastating increase in pollution or the opening of new regional environmental courts and a corresponding willingness of Chinese authorities to allow a certain level of citizen enforcement. Even though this is a huge step for the environmental movement in China, environmental courts have yet to openly show they have teeth. For example, they still have not accepted any cases against the largest companies and most important polluters. In the United States, public interest environmental lawsuits are part of the fabric of our environmental protection system. In China, the vast majority of environmental suits are personal injury or “tort” cases. These kinds of cases can only be brought by a victim directly injured by, for instance, a factory spill, and the victim carries the difficult and expensive burden of proof to establish that the individual factory’s actions directly caused her injury. Suffice it to say, most victims in China lack the resources to pursue these cases in court. But times are changing. By 2011, some 15 public interest cases had been brought to environmental courts by public entities and municipal governments. In 2012, two environmental organizations in China successfully brought the first public interest environmental law caseby independent citizen groups, suing two companies in Yunnan for spilling 5,000 tons of toxic cadmium waste. The case was widely reported in China and elsewhere, but the lawsuit has not yet resulted in compensation for the pollution victims or any punishment for the mining companies—in part because the environmental groups cannot afford an expert appraisal of the extent of the damage. While major cases against heavy polluters, such as the cadmium case, have not yet succeeded, Chinese citizen organizations have won cases establishing important precedents for the right of citizens to information—a core element of any system of public participation. Last year, Pacific Environment’s partner Green Anhui won a case against the city of Anqing , which refused to release environmental information the group had requested. This is one of the first cases in the nation that demonstrates that China’s open information laws will be enforced— at least by some courts. But there are countervailing winds. Pending revisions to China’s environmental laws by the government threaten to weaken citizen enforcement of environmental laws in court by local environmental organizations. This move has generated widespread criticism because it will strip most environmental organizations of their right to bring public interest citizen suits to court. In economically thriving but heavily polluted China, the need for and popularity of legal remedies for environmental problems is dramatically increasing. Yet, the institutional and legal structures necessary for a robust use of courts as venues for environmental justice are not well established. Pacific Environment and our environmental partners in cities across China, are exploring what the current limits are. 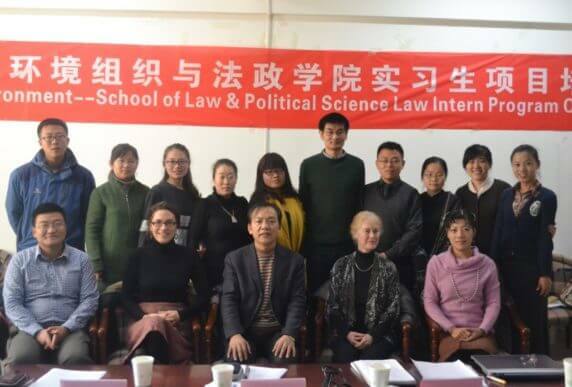 In collaboration with Ocean University’s School of Law and Policy, our Rule of Law Project pairs graduate students with three of our partner organizations: Green Anhui in Hefei Province, Green Stone in Nanjing, and Green Camel Bell in Lanzhou. Some students will work directly on environmental law cases, while others will provide partners with improved legal tools. For example, Green Stone’s intern will help establish stronger information sharing systems that will allow local citizens to better participate in environmental reviews. Green Camel Bell’s intern will review and compare environmental laws and enforcement in Lanzhou city with national standards to set the stage for local advocacy efforts. Through training the next generation of China’s public interest lawyers, and connecting them with their future clients—citizen groups in communities across China—we help build strong voices for a robust environmental law system in years to come.